Speaking at a press conference in San Francisco on Thursday, Nadella emphasized Microsoft's strategy to address customer needs while also enabling developers and supporting the IT management needs of organizations. 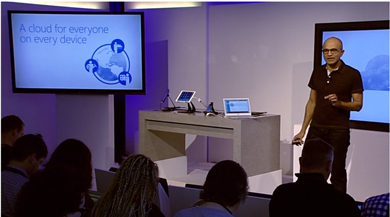 Microsoft's worldview is all about "ubiquitous computing and ambient intelligence," Nadella said. He added that device form factors are changing and that silicon and software are co-evolving. Everything is becoming digitized and Microsoft's focus is on improving what can be done with machines and between machines. Users, devices and applications are all getting connected via the cloud, he added. Microsoft's Windows monopoly is slipping in this emerging, mobile-centric world, according to observations by Gartner Inc. and other analyst firms. Nadella seemed to tacitly acknowledge that trend toward the end of his talk. "One of the questions right up front I wanted to address is what about Windows, where does Windows fit in with all of this?" Nadella said, according to a Microsoft transcript. "Windows is a massive agenda for us. We will innovate and you will see us talk next week [at Build] about the great innovations in the operating system and great innovations in devices. At the same time, we are absolutely committed to making our applications run what most people describe as 'cross-platform' great." Nadella added that that this cross-platform approach didn't entail any tradeoffs for Microsoft. It's just part of its motivation to address customer needs, both business and consumer. Office for iPad is available from the Apple Store as of Thursday. It's designed to run on iPads with iOS 7.0 or later iOS operating system versions. The release was demonstrated during the talk by Julia White, general manager of Office Division technical marketing, who showed that Microsoft's productivity suite was optimized for touch on Apple's tablet. A "touch-first" version of Office for Windows will arrive later in Microsoft's Windows Store, as well as versions for "other popular programs," according to a Microsoft announcement. Office for iPad is free to use for reading or viewing documents. However, an Office 365 subscription is required to create or edit documents. In related news, Microsoft is making Office Mobile for iPhone, as well as Office Mobile for Android-based smartphones, free to use, according to Microsoft's announcement. Those mobile apps can be downloaded, either from the Apple Store or Google Play store, respectively. Microsoft had previously required Office 365 subscriptions to use those mobile apps. Office Mobile apps lack a lot of the functionality of the Office suite products, but users do have the ability to view and edit documents. Office for iPad is actually arriving first before a touch-optimized Windows version. Former Microsoft Distinguished Engineer Hal Berenson had offered a possible reason, stating that APIs for WinRT, which is the Windows Store Apps (formerly known as "Metro") development platform of Windows 8, are "deficient" compared with the APIs of Android and iOS. Microsoft has been somewhat slow in touch-optimizing Office for the WinRT platform. The last announcement came from former Microsoft CEO Steve Ballmer, who had promised back in October that Microsoft would release Office for iPad when it had first touch-optimized its Office productivity suite. Currently, Microsoft Office for Windows 8 systems has controls that are sometimes awkward to navigate using a finger. The Office for iPad release, though, was described as a "native" app. White said that "this is definitely not the ported Windows app to an iPad," adding that "it's uniquely built" for Apple's machine. The other product announcement was a new licensing option supporting mobile device management. Microsoft plans to release a new Enterprise Mobility Suite (EMS) licensing option to enterprise volume licensing customer starting on May 1. EMS licensing consists of the rights to use three products: Windows Azure Active Directory Premium, Windows Intune and Windows Azure Rights Management Services, which is a scheme for adding document security protections. The EMS subscription-based licensing will be issued on a "per-user basis," so it's not associated with specific device use. Supposedly, the new licensing will make it easier for organizations to implement bring-your-own-device types of scenarios while also enabling mobile device management capabilities by IT pros. Windows Azure Active Directory Premium was released as a preview back in November, but it will hit "general availability" product release next month, according to a Microsoft blog post. The premium offering offers some added management controls for enterprises beyond those controls enabled through Microsoft's free Windows Azure Active Directory solution. Those additional controls include the provisioning of groups, management of SaaS-based applications and activity reporting for increased security. The Premium product also supports single sign-on to SaaS apps by end users, as well as multifactor authentication for added user verifications, plus the ability for end users to reset their passwords. Microsoft provides a service-level agreement of 99.9 percent uptime for the premium version and throws in use rights for Forefront Identity Manager. Windows Intune is Microsoft's cloud-enabled device management product that supports various platforms, including Apple iOS, Google Android and Microsoft Windows, Windows RT and Windows Phone. It's periodically updated, including new features, with the last update occurring in January. Microsoft plans to offer Windows Azure Active Directory Premium, Windows Azure Rights Management and Windows Intune as a bundled offering for $12 per user per month. However, the EMS licensing offering will provide that same bundle at a 30 percent discount for $7.50 per user per month when it's bought by organizations through Microsoft's enterprise volume licensing, according to Microsoft's data sheet (PDF). News about Office for iPad and the new EMS licensing option got leaked earlier in an article by veteran Microsoft reporter Mary Jo Foley.